Visit the permanent link to “The PROTIUM mobile application architecture for iOS and Android”. Circuit Breakers are most useful for networking where remote calls can fail or time out at any moment. When configured thresholds are reached, the circuit breaker “trips” and thus prevents putting unnecessary load on the server until the breaker resets itself after a timeout. In addition, my Swift implementation provides convenience features such as monitoring call timeouts and supporting retry logic with exponential backoff. Visit the permanent link to “Swifty Circuit Breaking”. A fast gesture recognizer based on the PennyPincher algorithm, written in Swift. Penny Pincher is a fast template-based gesture recognizer, developed by Eugene Taranta and Joseph LaViola (full paper reference below). The algorithm is well-suited for mobile applications since it is both fast and accurate and, as shown in the evaluation by the authors, outperforms other recognizers. My Github project provides a Swift implementation of Penny Pincher and shows its usage in a simple example project. Also, the framework contains a UIGestureRecognizer subclass that integrates well into the existing gesture recognition framework of iOS. Eugene M. Taranta, II and Joseph J. LaViola, Jr.. 2015. Penny pincher: a blazing fast, highly accurate $-family recognizer. In Proceedings of the 41st Graphics Interface Conference (GI ’15). Canadian Information Processing Society, Toronto, Ont., Canada, Canada, 195-202. Visit the permanent link to “A fast gesture recognizer based on the PennyPincher algorithm, written in Swift.”. which documents a user is most likely to open next. which commands in an auto-complete menu might be triggered next. which fonts in a font-chooser widget might be selected next. To improve on other common methods such as recency-based and frequency-based predictions, AccessRank adds Markov weights, time weighting, and other parameters for calculating a final score for each item, while the algorithm tries to maximize both prediction accuracy and list stability. Prediction accuracy is important since top items are easier and faster to access than items in bottom sections; list stability is important since automatic reordering of items can impede usability when users try to reselect an item based on an already learned location. You can configure the algorithm depending on whether you prefer more prediction accuracy or more list stability. Once AccessRank has calculated predictions, you can use the resulting list to enhance your user interface in various ways. For example, you could display the most likely next items in an additional list as suggestions, or you could visually highlight relevant objects to give users cues where they might want to go next. Stephen Fitchett and Andy Cockburn. 2012. AccessRank: predicting what users will do next. In Proceedings of the SIGCHI Conference on Human Factors in Computing Systems (CHI ’12). ACM, New York, NY, USA, 2239-2242. Visit the permanent link to “Using Swift to Predict Revisitations and Reuse”. The image above shows how randomly placed touch points (the smaller, semi-transparent circles) select their corresponding targets (the nine big circles). In the user interface of a mobile app, for example, BTC could be used to more accurately determine which menu item the user intended to select. The point of using BTC instead of visual boundary checking is: The intended element is not necessarily the element where the user’s touch lies exactly within the visual boundary of the element (e.g., the touch point might be somewhere slightly outside of the visual boundary). BTC has the advantage that it does not require more detailed information about the touch point (finger posture, touch area…). The only required input parameters of the formula are touch location, target center, and target diameter. Xiaojun Bi and Shumin Zhai. Bayesian touch: A statistical criterion of target selection with finger touch. In Proceedings of the 26th Annual ACM Symposium on User Interface Software and Technology, UIST ’13, pages 51–60, New York, NY, USA, 2013. ACM. The paper is freely available on Research at Google. Visit the permanent link to “Improving iOS Target Selection for Finger Touch Using the Bayesian Touch Criterion”. Plumber is a tiny Objective-C library for creating curved connection lines between nodes (for flowcharts, for example). The constructed path connects the bounding boxes such that the distance between two sides is minimized. I’ve created it since a quick Google search did not reveal anything simple for iOS. The curve calculation algorithm is a direct port of the function used in the Graffle Example of the vector drawing library Raphaël. Visit the permanent link to “Plumber: Objective-C library for Curved Connection Lines”. Nowadays, developers often work in several different development environments and text editors. For example, you may need Eclipse for regular Java development, Android Studio for Android development, Xcode for iOS development, Visual Studio for C#, Sublime Text for web development, etc.. Every tool, however, has different keyboard shortcuts. Since it is hard to remember all shortcuts, there’s a constant loss of productivity when switching tools. If you don’t want to edit all shortcut sets in every tool, you can instead use CodingKeys as an “abstraction layer”. CodingKeys lets you define unified shortcuts, which are dynamically re-mapped to existing shortcuts of other applications when you switch tools. All mappings can be conveniently edited in a single configuration file. The config file also gives you a nice overview over all shortcuts and grows as you add new apps to your coding toolbox. Visit the permanent link to “CodingKeys: Unified keyboard shortcuts for your development tools”. DollarP-ObjC is an Objective-C port of the $P gesture recognizer to be used in iOS applications. More on my Github page. 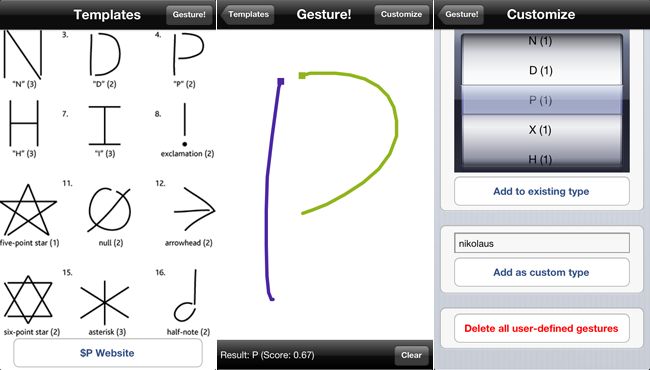 Visit the permanent link to “Advanced Gesture Recognition in iOS”. TUIO is based on the OSC protocol and usually transferred via UDP. Tuio.js uses node.js and Websockets (Socket.IO) to push OSC/TUIO messages to the browser. TUIO.js converts the messages to events that applications can register with. Visit the permanent link to “Tuio.js: Multitouch and tangible interaction in the web browser”. Recently, the facebook API has been voted »Worst API« in a developer survey. Bad news first: It really is the worst API (or at least the worst API that we have worked with). Good news: It would be quite straightforward for facebook to drastically improve the overall app development experience by working on at least one specific area (see end of this article). Visit the permanent link to “Why Facebook App Development is Seriously Flawed”.